A magnetic loop, increasing in stored potential, will induct a dielectric field that diminishes with distance. However, as the charge induction is a function of change in magnetic strength in the flux ring (ΔΒ), the maximum induction comes with maximized rate of change in the flux potential. Were the changing current following a sine function, then the induced charge would change in voltage potential in a 90° phase lag. The upshot of the phase-lag is when the magnetic potential change is produced as a pulse event, a positive AND negative phase exists in the induced charge patterns on either side of a null-charge center that remains uncharged in either polarity during the pulse cycle. Increasing the potential of a magnetic flux-loop (See the blue toroidal core of Fig. 2., e.g.) the skyrmion charge outside increases as a charge of a certain polarity, with an opposite polarity charge at point-center of the flux-loop center. Decreasing core magnetic potential produces a skyrmion of an outer negative charge. 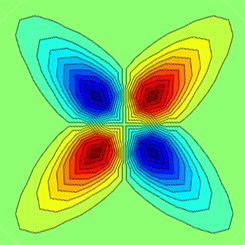 The skyrmion dielectric charge structure disappears with each flat-slope in the change in the magnetic potential, ΔΒ; of the flux-loop. More precisely, the charge-pump of the inductive quality stops pumping to all parts, simultaneously, of the skyrmionic wrapper of the toroidal flux-loop. Any quality of capacitive loading of the system will create a time-dwell that can host a harmonic instance of the dynamics of the ΔΒ δt. Optimized resonance occurs when stored dielectric energy balances stored flux-loop energy. Fig. 1. An illustrated virtual dielectric potential spherical shell —a precursor to the harmonic instance that developes a virtual charge monopole at the toroid center. The monopole-centric induced wrapper of a magnetic flux ring is called a skyrmion. The image is from Australian Center for Quantum-Atomic Optics Note that there is no spin-dynamic hinted in the illustration as a static object-of-rotation. Harmonic surface waves, per se, on the blue torus form, have many interlocking overtones at certain integer harmonics between dual angular momenta inherent with the toroidal topology and through-the-hole phase geometries. When no zero-crossing of magnetic potential exists, only a unidirectional pulse in the magnetic potential (or stored energy density}, with harmonics in the spectral signature of the pulse, then a modulating dielectric field is created, but with a reversing polarity that tracks the slope of the pulse over time. Pulsation in the density of magnetic potential in the blue toroid (see Fig.1.) creates a stability by charge at the torus center-point induced by delta-flux during pulse edges. When magnetic flux the blue torus increases, a dielectric charge is induced at the torus center-point, and a decreasing gradient of charge along the torus axis. The charge polarity oscillates through zero as the magnetic potential modulates above zero, with no flux potential reversal required to change the induced dielectric charge through a zero potential. The induced charge polarity is determined by the slope of the change in the magnetic potential. E.g., positive slope during a change of magnetic potential creates a positive charge at the center of the torus. And negative slope induces negative center-point dielectric charge. The induced charge peaks when this magnetic vector potential slope is at the highest level. When there is no magnetic potential change, the dielectric is at neutral —or more precisely, not being charge-pumped. The structure lends credence to a plausible stability-structure of ball lightning, as a physical, but rare, plasma-ring (a smoke-ring of plasma) was pinched tighter in a rapidly increasing magnetic field until the flux comrpression induced a strong outer field of ions serving as a spherical conservance for the inner morphology at right angles into the magnetic ring topology. The lightning bolt is a gather of feeder discharges contributing from the volume of cloud, which is the charge source. The dischages increasing the current in the lightning bolt would increase the dielectric charge in air at the center of the incident plasma ring. The outer spherical region of the skyrmion model assumes an opposite charge. This is an incomplete hypothet that does not explain the long-term survival of an event requiring a high delta magnetic field to create high potential ion field. Save maybe that when ion-conduction threshold is reached, that the conductive structure would also find conservancy to the classical vector boson (a skyrmion), and serves as a discharge path of the energy stored in the core plasma flux-ring. Notice that from the outside, the skyrmion would have an interaction as with a particle, dielectrically, as a charged particle. The behavior of the spherical interaction would find an inductive coupling with the totality of stored magnetic flux in the core magnetic-ring. The reflection of an external dielectric pulse would then carry away information of a sphere at radius. Were a proton to be a ring-model of magnetic flux upon an aether foam, by the skyrmion model, it would externally observe as a charged sphere. This just happened attempting to reply on a short mention to the Moon Tides Brainstorming thread of 30 scientists. The concepts played are correlate models of a push-gravity as a 2pi period of stochastic valence within the aether foundation energy --if I know how to choose the right terms to communicate the mind walk. Submarine hull-pressure is produced from strain translated sonic speeds. Pressure density of a spheroid that was impervious to aether passage, and therefore maintaining the energy density as a counter-strain stored in the topology of the sphere, an elastic surface balancing inner against outer, finding a conservancy in the shape of a sphere. The pressurized sphere maps distortion away from spherical as a function of gradient of pressures across its surface, such as the increase of pressure at depth in water, or atmosphere. While compressing, numeric simulations express the electrohydrodynamic (EHD) qualities of star plasma during a crushing compression cycle of a super nova form a shrinking toroidal vortex. The toroidal vortex introduces chirality, a handedness in regard to the sign of the angular spin introduced by the vorticular dynamics of toroidal vortex. A torus may spin clockwise or counterclockwise. The act of the space-volume of plasma star mass compressing toward a 3D-center created a gravity wave purturbation in the 3D gravity well of the star mass. The act of plasmoid EHD compression of mass-space also affecting a simultaneous toroidal rotation of star plasma (also the magnetic field generator of Earth's flowing iron core per some) suggests a connection. EHD gravity-wave connects as a function of the toroidal electro-hydro-dynamics of delta-star-mass-density. * The connection is mass-to-current as a leverage upon the gravity well. The topology is the toroidal dynamic due to the orthogonal nature of force between electricity and magnetism. The torus is the topology of the change dynamic. Push-gravity (my term, hot aether —a stochastic aether affair) as a coupling on Δ-space-mass as Δ-time; a temporal discontinuity as a 3D topology, being the leverage for the dynamics of a gradient in time. Expanding 3D singularity of shrinkinig-time would be a star burst, a white hole. Expanding 3D singularity of expanding-time would be a black hole. Fixed 3D instance of a time-wave [allow the label-abuse until explained, please] oscillating in a sphereical containment, an internal reflector of the time wave, a temporal Helmholtz oscillator. The topology of a standing wave of a harmonic instance of this hypothetical time-wave is therefore completely and only a standing spin-wave formed as a closed-system. The gradient affect of the temporal-wave was only in production of the completion of a quantum event. Although proper time does not have a definition in the meta-description of time itself as a completion-gradient in the quantum duration of mediation of electromagnetic and inertial forces. Bending time in a gradient across a region of space is equivalent to creating a gravity field in that same gradient region. Self-recursion of closed-systems of impulses captured to strain-points with qualities use this same mechanism of temporal discontinuity as 3D gravity well. The duration of a quantum transition is determined by the local aether foundation, and is therefore a determinance from a domain wholly outside the domain of mathematics, or reckoning... a mathematical iconery of what is the source cause. This allows any manor of ideomatic signficance attached to the temporal-gradient without removing God from any of it... and it also adds some pause when pondering upon various engineering anomalies Princeton University charted for three decades in regard to human emotion affecting our future random options. The conceptual-mechanics cross over from ovalized submarines to ovalized 'particles' of analogous rolls: compression of time across a gradient of space will energize the stored energies of a toroidal strain systems, just as would the helical excitation by compressing space-mass of star hearts. The missing mechanism offered is a Skyrme solution imposed by the behavior of the aether, or whatever the proper term may be, which entails structured storage as binding energy created during the change-in-system-energy, arising from the inductive qualities of EM 3D space —behavior of the aether. "Intended specifically to help experimental groups just beginning research in ultra-cold atoms, this resource page presents detailed technical information relevant to constructing and operating a Bose-Einstein condensation machine." Welcome to the world of nanokelvin atoms and the magic of matter waves! An optical nano-fiber is a cylindrical dielectric waveguide that can guide light with a wavelength larger than the fiber diameter. To make a nano-fiber standard step-index telecommunication optical fibers are tapered over a hot flame so that their core vanishes and their waist diameter shrinks to a few hundred nanometers. The sub-wavelength diameter of the fiber allows a large fraction of the guided power to reside in a small region of space surrounding the fiber, this is called the evanescent field.